Looking for leaks in the gas distribution system. 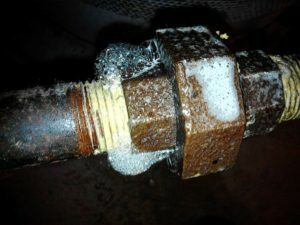 All accessible and exposed joints and unions are checked for leaks along with accessible components connecting to the piping in furnaces, water heaters, gas logs, stoves or other attached equipment. This is not a pressure test, it is performed using an electronic detector and leak detection liquid to confirm a leak. Pressure testing only checks the main piping as far as the shut off valve which excludes the most common source of leaks, the union and pilot light connections. This test is suggested for all homes with natural gas or propane gas heating.